Captain Chris Wells was born in Bournemouth, and grew up in Poole, where his association with the sea was developed sailing and fishing on Poole Harbour. He was educated at Poole Grammar School, completing 'A' Levels, before starting his sea-going career. In 1974 he began a four year cadetship with Shell Tankers, attending the Warsash School of Navigation at the University of Southampton. His early days at sea were mostly spent in the Far East, trading out of Singapore on a variety of tankers. He continued his career with Shell, gaining his Master's Certificate in 1985, and progressing to Chief Officer, serving on a variety of ship types, including VLCC's, bulk carriers, and Gas carriers. He combined this with a Commission in the Royal Naval Reserve, where he holds the rank of Lieutenant Commander, and serves two weeks annually with Maritime Forces in the Amphibious Warfare specialisation. In 1992, he joined Cunard Line, when a vacancy became available for a second officer on board Queen Elizabeth 2. He was promoted through the ranks, serving as Chief Officer on QE2, as well as Cunard Countess and Royal Viking Sun, before being promoted to Staff Captain on board QE2 in 1999. Captain Wells met his wife Hedda on board QE2. They were married in 1997, in her home town of Husum in the North of Germany, and now live in Barnham, near Chichester, in West Sussex. They have three children, Henry (8), Emily (6), and William (4). In April 2002 Captain Wells was appointed to the site team at the shipyard of Chantiers de l'Atlantique at Saint Nazaire, France, to represent Cunard Line during the construction of Queen Mary 2. He was the first Staff Captain of the new ship when she was handed over to Cunard on 22nd December 2003, remaining with her until May 2005. Following the merger of P&O Princess with Cunard's parent company Carnival, Captain Wells was then appointed to Caribbean Princess (at that time Princess Cruises' newest and largest ship) as Staff Captain. 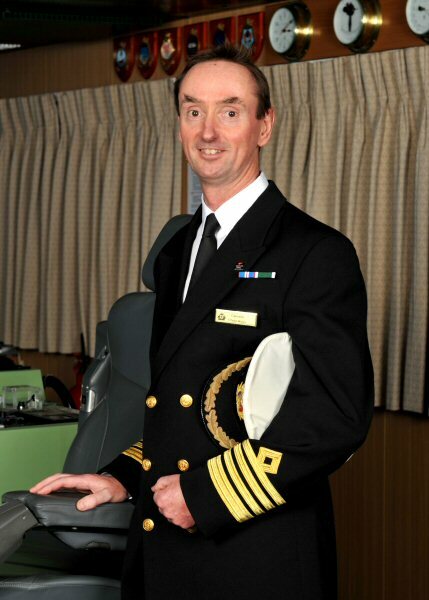 In April 2006, Captain Wells was promoted to command P&O's Oriana, and he has subsequently also commanded Oceana. He is now honoured and delighted to return to Cunard Line, to command the magnificent Queen Mary 2.